Self and all its wonderus resultants. The Visible Dave Project is a research project in modeling my physical body. My focus is on the general topics of MRI, DICOM, 3d modeling, 3d projections, data visualization, data fusion, and fun tricks for personal pleasure. If anyone has access to time on an MRI/fMRI machine in testing, please let me know...I would love to co-register with more datasets for temporal change analysis. CT is great, but I don't enjoy radiation. The data is from an MRI I had done in 2002. I didn't have it for diagnostics, it was just a sample MRI so that I could do visualizations with it. My head dataset is 256x256 which is pretty high resolution for MRI (low resolution when compared to things like CT). I have two datasets consisting of the sagital and transverse view. Slice thickness varies between the sagital(1.5mm) and transverse(1.7mm) views. If you are interested in my DICOM data for your own research, please let me know. I have them available to download... I just enjoy hearing from people interested in this sort of thing. I'll continue updating this page as my project progresses. I plan to build means of correlating my models against other models. I think the NIH - Visible Human project provides a wonderful dataset to correlate against. I'm starting to think about ways to print my head out in physical form. At this point I have no idea on the best or cheapest way to do it. Anyway, if it is relatively cheap...I may just do it. How cool is that? A 3d model of your head on the desk. Talk about personalized art! 3d printers like ZCorp may be an option. [Read more about this art] I just recently bought some art from Bathsheba Grossman, she really inspired me when I saw her rendering of DNA with molecular surface! To the left you'll see a picture of the DNA model from Grossman's site but the picture really doesn't do it justice. There is also another company doing work with crystal proteins luminorum but they don't look quite as pretty. On another somewhat seemly un-related side note, all these thoughts on three dimensional data, visualization, and math has got me thinking about a kids toy. Zometool is a very neat toy, it allows you to teach a child geometry and math using sticks and balls. It feels a little like a mix between Legos and Tinkertoys, but zome is much more mathematical. With it you can create structures like hyper-cubes. Neato. Definitely going on my fun toy wishlist. I'm thinking about buying the book Zome Geometry, which gives a nice tour through a lot of great math structures and theorems. My nephew just got a kit and I was pretty impressed. You can even buy professional kits for huge structures. The Zome system is made by Zometool, Inc.
DICOM is a image format for medical imaging. Hospitals have ultrasounds, CTs, MRIs, and other equipment that store and transmit data in DICOM. So access and processing of these formats is very handy to have. DICOM is not just an image format. 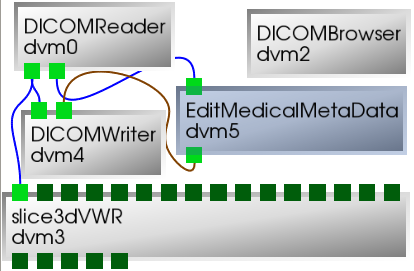 DICOM also does transport and routing (and I'm sure other things I don't yet know of...seems like a pretty big spec and I haven't had time for it all). I would like to get another head scan so that I can do comparative modeling of my internal structures. I would like to use these comparative models to build custom models which I can further study. So I can with my MRI, label and 3d model my brain surfaces. I could then overlay additional information for the surfaces. It would be very interesting to model EEG data on my brain region models. This would allow me to model structures over time in 3d and apply higher dimensional information to the question at hand. For instance, model the REM cycles and provide a count of periods of activity within the stages. Interesting. Knowing the surface of 3d things and how they interact in space can provide you with a wealth of information. In this model, I'm studying the real matter that gives rise to my thoughts and actions. The shape and interactions of my physical brain define the world as I perceive it. It amazes me, when I think about the effects of morphology on our physical world. In biology, surface interactions indicate enough information to build medicines that change 3d protein confirmation and thereby control gene expression. Controlling gene expression can offer the ability to modify feedback loops that happen over time. Using photo-realistic models which are also physically-realistic could be very interesting. Then add to that the speech synths which will reproduce speech based on personalized vocal cord models...and 3d animations of the human body based on the real physical joints. Integration of multiple models provides for very scientifically accurate immersive environments for research and collaboration. I'm finding more of the programs and libraries I need to start getting results from my data. Thanks so much for everyone who has provided me with comments and questions. AMIDE: Amide's a Medical Imaging Data Examiner - competely free tool for viewing, analyzing, and registering volumetric medical imaging data sets. On a mac, first of all, I would suggest installing OsiriX. It is quite good. VoluMedic a add on for LightWave3D with DICOM support. When building itksnap.trunk on the Mac I had trouble finding the ITK_FLTK_RESOURCE I would always get a ITK_FLTK_RESOURCE-NOTFOUND error from cmake. This is the resource file that FLTK provides for mac. It is included in your FLTK src tree under FL. (fltk.trunk/FL). The actual resource file is named mac.r inside this directory. Professional DICOM viewer with free demo - Rubo Medical dicom viewer, pay. Update: I've gotten the latest ITK-SNAP and it has produced me a great 3d mesh from the results of the automatic segmentation engine within ITK-SNAP. I've uploaded a few screen shots in my gallery. I've found getting the parameters right for segmentation is hard. There is a real art to the proper selection. What I'd like to be able to do is load a reference set of data with existing segmentation results and try to match my real data against it. I would like to get a huge set of labels for the brain and do this. It should be possible, right? A common format used today in fabrication shops is STL. MeshLab - is an open source, portable, and extensible system for the processing and editing of unstructured 3D triangular meshes. In the future, I'd like to load these meshes into a 3d silverlight application so people can select and explore my structures right on the website. I like this picture because it is symmetric...and a bit freaky. ;) It is of me playing with the Mac PhotoBooth mirror effect. I plan to build a model of the above view. I thought Brain 3D Chart - Raised Relief Chart was neat too. Data visualization in crystal - some very cool crystals of the human heart and CT scans shown. Tactile Visualisation: Feel your data! - has an awesome pdf with information on taking data and creating physical 3d models for exploring data tactilely. SourceForge.net: Grassroots DICOM - Grassroots DiCoM is a C++ library for DICOM medical files. It is automatically wrapped to python/C#/Java (using swig). It supports RAW,JPEG (lossy/lossless),J2K,JPEG-LS,RLE and deflated. It also comes with DICOM Part 3,6 & 7 of the standard as XML files. idoimaging.com - dicom and related software index. 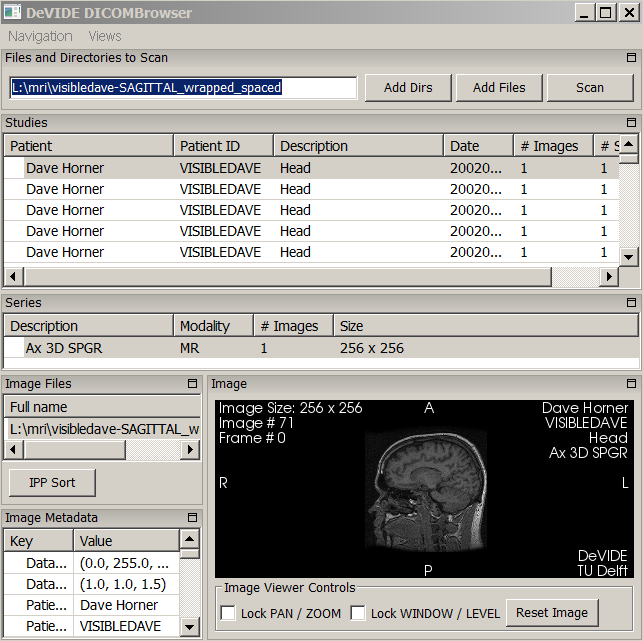 Dicom3tools Software - command line utilities for creating, modifying, dumping and validating files of DICOM attributes, and conversion of proprietary image formats to DICOM. OsiriX 1.0 for the iPhone!! Haha, I love to see stuff like this running mobile. Magnetic-Field-Induced DNA Strand Breaks in Brain Cells of the Rat - interesting research showing free radicals increase DNA single- and double-strand breaks due to prolonged exposure of magnetic field. I didn't know there was a Sigma assay to measure an index of DNA damage. Then also to treat for it using free radical scavengers! Very nice models, though they cost money. I've been sitting on this optical topography article I found from a science journal in 2005. I really like the idea of using optical properties for diagnostics. Maybe someday, I'll have enough time to work on a optical topography helmet, like the one I saw in that journal paper. However, I'd really like to setup a merged optical topography and EEG topography rig. Brain Topography - does ($$), cool to see a journal on it. Inside Bill Moorier's head - looks like a swf MRI explorer with two photo view navigation. Radiology Art: art made with x-rays using CT and MRI scanners - medical student, Satre Stuelke ct scanner as a camera. I'm not sure what made me finally do it. I've been meaning to fix it for so long. But I'm happy I finally did. I used GDCM to correct the phase wrap artifacts in my sagittal scan. My nose is now attached to my face! I modified gdcmimg to support wrapping in the x direction. Empty/null data on the left and right sides of the scan made a simple wrap insufficient. I solved that issue by overlapping the right side of the "wrap region" with the left side of the scan. Then when compositing within the region of overlap, I select the highest contrast non-zero value from the two sources. Once gdcmimg was modified, I still needed a way to run that tool on all my DICOM files. I looked around a little bit for a tool...couldn't find what I wanted. So I created a new tool (using gdcm primatives) to search for dicom files within a directory and run gdcmimg with the new wrap options specified. The code isn't yet ready to share (not sure if it is even worth sharing), but a picture...can be done. I can now offer you the corrected dicom files if you'd like em. I will post a phase-wrap corrected animation some day too. Now working to create a nice looking 3d projection with my nose where it belongs..
Computer Assisted Surgery blog - Going under the knife with technology. Asclepios Research Project - INRIA Sophia Antipolis - SepINRIA is a free software dedicated to Multiple Sclerosis brain MRI analysis. IBASPM:Individual Brain Atlases using Statistical Parametric Mapping Software - matlab code. I would like to start cutting and rendering multiple models here soon. Hoping to be able to use blender. Neuropsychiatry Section - Pyvox (formerly known as BBLimage) is a set of software tools for medical image processing, particularly skull stripping and segmentation of MR brain images; Written in python and C. Under open source license..
whoa. Long time since last update. The LONI Probabilistic Brain Atlas (LPBA40) - Each MRI was manually delineated to identify a set of 56 structures in the brain, most of which are within the cortex. These delineations were then transformed into a common atlas space to produce a set of co-registered anatomical labels. The original MRI data were also transformed into the atlas space. Segmentation Validation Engine | - The Segmentation Validation Engine (SVE) provides an automated online framework for performing validation studies of skull-stripping methods. Registered users may download 40 T1 MRI volumes, skull-strip them with the algorithm of their choice, and upload their segmentation results to the SVE website. The server will then compare the 40 skull-stripped results against a set of manually generated brain masks. The server computes a series of measures for the uploaded data, including Jaccard and Dice measures. It also produces images for visualizing the spatial location of the segmentation errors relative to a common space. The results are archived on the server, and the measures are viewable by visitors to the site. a lot of good content within the Brain Science Podcast. 79-"We actually are becoming an expression of the type of technology that we create. So, our brains not only create this technology, but they make it sure that whatever works—whatever tool that is capable of augmenting our reach— becomes assimilated as an extension of the internal brain model of our self." devide - Dataflow application builder for the rapid prototyping of medical visualization and image processing techniques - Google Project Hosting - DRE is in fact a Python distribution that includes cmake, swig, Python, numpy, matplotlib, wxPython, gdcm, VTK, ITK and DeVIDE itself. iHealth lab - MITO - Medical imaging toolkit - MITO - DICOM Viewer | SourceForge.net , a dicom viewer with Kinect and Wii control. One tweet, neurocosmology perceptual modulaton. A Postmortem of H.M.'s Brain | Science | Smithsonian - unknown lesion caused by the surgery, a finding that could shed further light on the anatomical structures responsible for memory. Scientists Digitize Psychology's Most Famous Brain - Wired Science - opening of a new chapter in one of the longest case studies in the history of science. Beautiful 3-D Brain Scans Show Every Synapse - YouTube - unconventional science. you've got to see the wires -- where they come from, where they go. understanding how cells in the brain communicate with each other. information forces you into an uncomfortable position. (change to 1080res). humanæ - Humanæ is a chromatic inventory, a project that reflects on chromatic range of our different human skin color-tones. - the meta converstation. gonna have a montage. a ImageMagick montage. L8Enpgp.jpg (2000×2050) a montage! the Tricorder project | blog - interesting blog 3D-printable mini spectrometer, DIY CT scanner. Tricorder on the way.? Look at all the wonderful Dave Brain's on the internet. Dave's Brain - Welcome to Dave's Brain - another dave brain programmer with great notes. Dave's Brain a tumblr dave's brain and a Dave's Brain (daves_brain) on Twitter. Dave's Brain Blog: "My, What a Beautiful Brain You Have!" - brainpics - Dave - Picasa Web Albums, beautiful brains indeed. Ultra-High 3D Brain Model Unveiled After 10 Years of Delicate Dissection (VIDEO) - 7400 slices, layer spacing of 20 micrometers, enabling individual neurons and their connections to be viewed. healthy 65 year-old donor. CTK DICOM Web Services - Commontk - WADO;Web Access To DICOM Objects RESTFUL image access everywhere.